I saw a few photos of Salem's gigs from this week on various blogs/websites, where he was wearing braces. 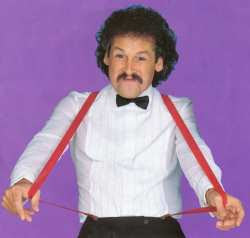 I immediately wondered if his new look was influenced by Bobby Ball!!! Now all Salem needs to do is grow a moustache and do a cover version of the duo's theme song "Together We'll Be OK" and then the transformation will be complete!! !